Hlangana Lodge is a four-star guesthouse set on more than a hectare of exotic gardens on the outskirts of Oudtshoorn, en route to the Cango Caves. The choice is yours: 12 standard, 6 superior rooms or the honeymoon suite. Hlangana Lodge has several leisure options to help you recuperate after a hard day’s sightseeing. Guests can enjoy the great South African outdoors in the landscaped garden, kick back and relax in a deckchair next to the saltwater swimming pool, or admire the skillfully crafted woodwork on the veranda. You can also catch up on your postcard writing, or enjoy a drink in the tastefully decorated lounge. Top restaurants are situated within walking distance (max. 1km) from our establishment. It is safe to walk. Hlangana Lodge offers round-the-clock service for our valued guests. Get the most out of your day. Ask at the front desk for advice on what to see and how to get there. Ask us to reserve a table on your behalf at any of Oudtshoorn’s fine restaurants. 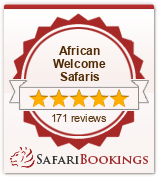 We also handle bookings for visits to the Cango Caves, ostrich show farms, Cango Wildlife Ranch and other attractions. Kindly ask at reception about these services. Please note that e-mail retrieval is subject to the availability of the office computer. Spoil friends and relatives back home with gifts from our carefully selected range of curios. Hand in conventional film or digital photo disks / cards at the front desk before 18:00 to receive your prints at breakfast the next morning. A night-watchman- security guard will guard your vehicle in our secure parking lot. Make a clean start the next morning. Our friendly staff will wash your car at no additional cost. We’ll arrange for your clothes to be washed, dried and ironed before 18:30 if we receive it by 11:00 that morning. Family rooms are available, Standard rooms with an on suite extra bedroom, max 4 persons. The Superior rooms are bit larger and have a separate toilet and a bath and shower. They are also fitted with DVD players. A selection of DVD movies is available. The Honeymoon Suite also offers a sitting room, spa bath and a private garden. It is best to explore Oudtshoorn and the Klein Karoo/Garden Route on a full stomach. Hlangana Lodge’s breakfast buffet is widely regarded as one of the finest on this side of eternity. You can stay for a week and still be excited about the variety on offer.